Rafi Martienko, age 21, knew he was Jewish, but had never cared much one way or another. Having lived all his life in Kiev, Ukraine, he watched avidly as the EuroMaidan protests brought the corrupt government of Viktor Yanukovych to its knees and the subsequent chaos due to the (still ongoing) Donetsk region revolt. But his take on all this was as another patriotic Ukrainian — Jews and Judaism had no meaning to him. On a mild summer day in late July last year, Rafi noticed a building on Zhilianskye street, in downtown Kiev, with a sign proclaiming “Jewish Community Center.” Out of curiosity, Rafi decided to check it out. He walked in and met a nice bearded young man named Aryeh Nizevitch – the first step in Rafi’s journey back to the heritage of his ancestors. That Chanukah, he already joined two Lubavitch bochurim, Avremel Glick and Ashi Goodman, on Chanukah mivtzoim. Today Rafi sports a hat, jacket, and small beard, and appears no different from most other Lubavitch bochurim. In fact, just two months ago he participated, along with his friends Ashi Goodman and Avremel Glick, in the first ever CKids Shabbaton in Ukrainian history. Ashi Goodman and Avremel Glick hail from the UK. 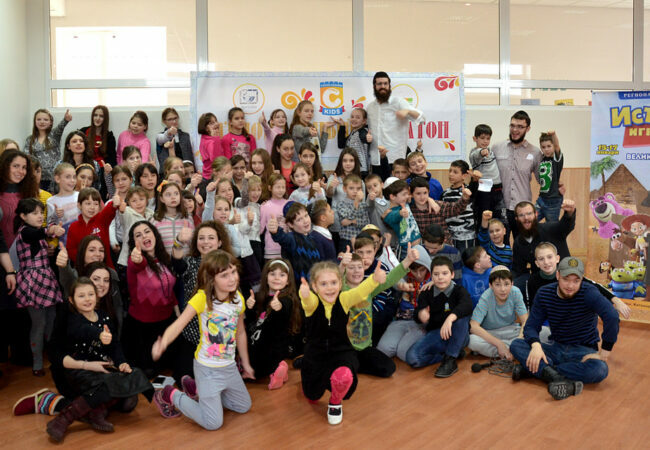 When they were assigned this past year to help Rabbi Motti Lebenhartz, shliach in Kiev, Ukraine, with his school, they took part in jump-starting a new campaign: to connect the Jewish children of Kiev with the CKids network back home. As a first step, Avremel and Ashi, in coordination with Rabbi Motti Lebenhartz and CKids Central, launched the acclaimed Tzivos Hashem CKids points system for the 150 students in the Kiev school. With the system in place, children began accruing points for doing mitzvos and redeeming them for amazing prizes in the online Tzivos Hashem CKids reward store. From Kiev, the TH points system made its way to Kherson, and soon the idea of a full-on, formal launch of a CKids branch in Ukraine was raised. The first step towards this vision was a unique partnership formed between Rabbi Lebenhartz and Shiurei Torah Lubavitch (STL), headed by Dan Makogon under the leadership of Rabbi Shmuel Kaminetzky, shliach to Dnepropetrovsk. Together, STL and the Kiev contingent planned a shabbaton for the children of Kiev, Kherson, and Zhitomir, which took place in the beautiful camp grounds owned by Chabad of Zhitomir, under the leadership of Rabbi and Mrs. Shlomo Wilhelm. And alongside the dedicated duo of Avremel Glick and Ashi Goodman, Rafi Martienko lent his indomitable spirit to the exciting shabbaton. From there, things snowballed. Every year, Chabad of Dnepropetrovsk hosts a gala evening in honor of the Rebbe on 10 Shevat, typically attracting the leading names on the “Who’s Who” list in the city. 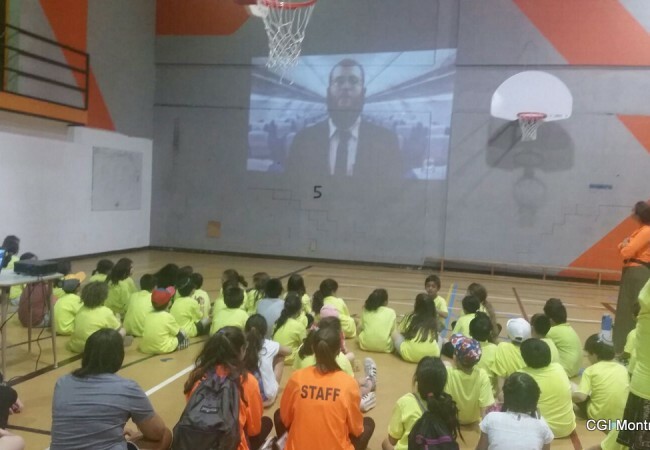 This year, the highlight of the event was the official launch of CKids Ukraine, with a special video presentation and a personal address by Rabbi Zalman Loewenthal, CKids director. It was phenomenal. 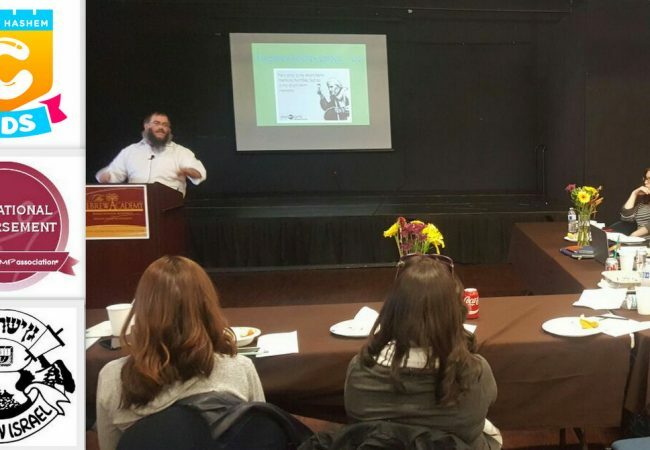 Nearly 500 attendees flocked to the Chabad Menorah Center to mark 10 Shevat and to hear about the evening’s highlight—the launch of the CKids network. They heard how children all around the world take part in CKids and how the network got its feet wet in Kiev and Kherson. 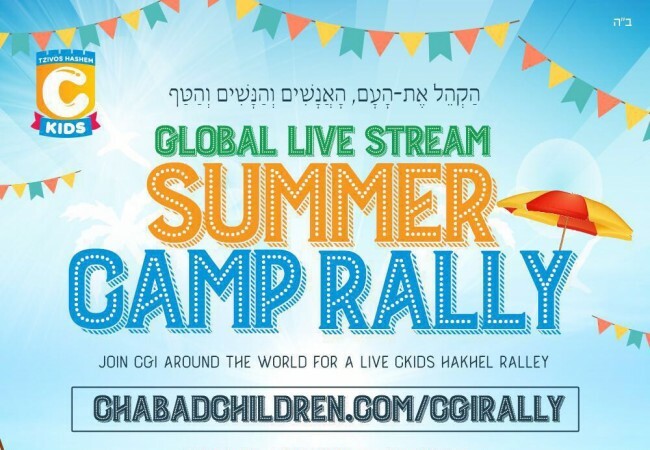 The exciting news that Dnepropetrovsk would be the next city to bring its nearly 600 Chabad school children into the CKids system brought the crowd to a burst of exciting applause. The children of Ukraine will not only get to take part in the exciting points system and world-class shabbatons; the next step is an entirely new edition of Kids Magazine—in Russian. The joint efforts of Chabad and STL in Kiev, Kherson, Dnepropetrovsk, and other cities throughout Ukraine, together with the talents and dedication of Rafi, Avremel, Ashi, and many more like them, are helping ensure that the Jewish children of Ukraine take their rightful place of honor in the army of Hashem.